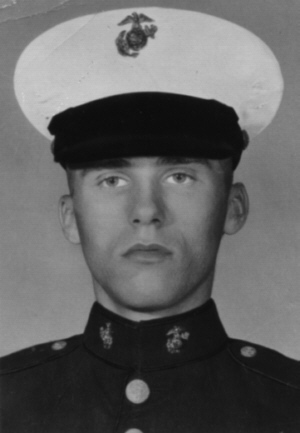 On July 24th, 1966, a young Marine by the name of Robin Lee Arnold lost his life in the jungles of Quang Tri, South Vietnam during an operation called Hastings. This site is in honor of the sacrifice he and his fallen brothers made to their country that dreadful day. You left far too soon, big brother. I was much too young to understand where you went off to and the horrors that you faced. When you didn't return, I was left with a void. Still, I kept the belief that there had been some awful mistake, that one day we would be told that there was an error and you'd soon be home. I wondered who was buried in your grave. I think about what life would have been like with you, Tink, and all I can do is draw a blank. Oh, you would find that you have 9 nieces and nephews. You'd have shared in the trials and tribulations of your brothers and sisters as they ventured through life. You would have watched as your mother continued on raising her children with no barrier too tough for her. And, sadly, you would have seen a Country that took far too long to recognize its heroes. But what about you, Tink? What have all of us missed out on having to live without you? I'll never know, not even in my wildest dreams. The only solace I have is that I know you are in a good place, beyond my current plane and that one day, I shall meet up with you. I miss you, big brother. I send all my love to you.